Whenever we’re contemplating a destination, we look for advice from friends, but then I realized – some of you out there might be where-to-wizards, and so here goes: We’re looking for a destination near the French/Swiss border – at the moment we’re contemplating Lyon, France. Any suggestions for what to do there or if there’s another spot we ought to head towards? If yes, hit the comment button and let’er rip. 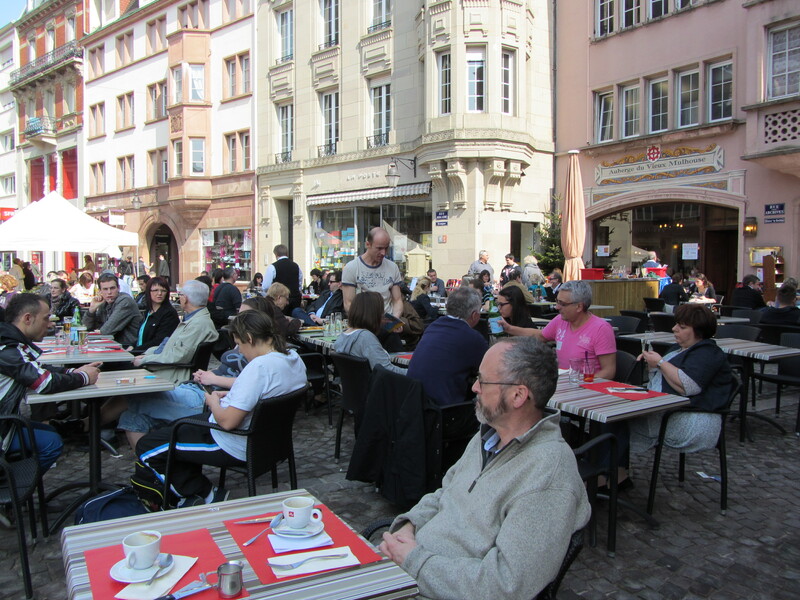 Hundreds of diners in Mulhouse's street cafes and not a single laptop in sight. 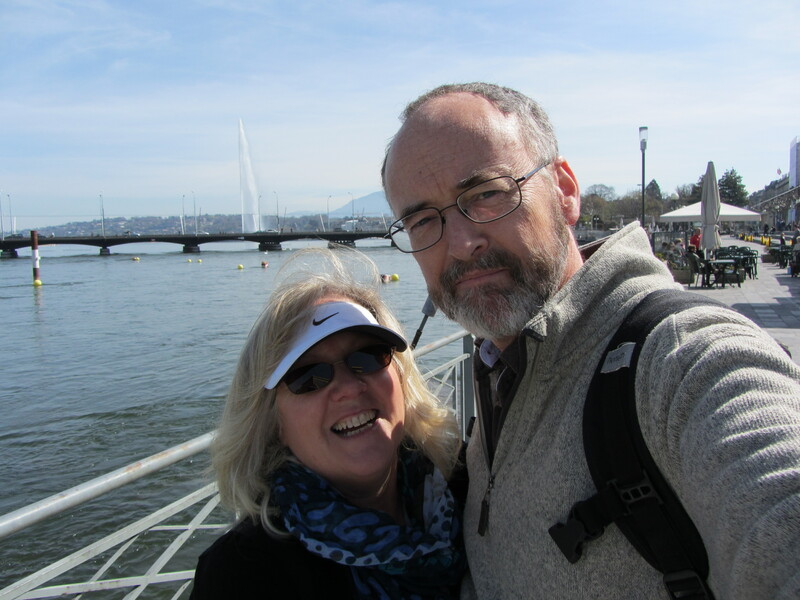 We had to leave Switzerland to get to Mulhouse, France, but this was not always a necessity. From 1515 to 1648, Mulhouse, then a free republic, was “an associate” of Switzerland, and did not formally join France until it went through some alterations by over-riding treaties with pretty names (Westphalia) and in 1798 voted itself into France during the early stages of the French Revolution. Basically, the residents said if there’s going to be guillotining, we want to be sure to be on the right side of the blade. This kind of history always fascinates me, because it is a reminder that Europe is as tribal as Afghanistan, Africa and the scarier parts of Asia, not to mention the American aboriginal population. Yet somehow, France, Germany, Switzerland and the rest all managed to cobble themselves into nations and organize themselves to a degree where they were able to overwhelm other ‘nations’ that had less control over their tribalistic qualities. We thought the Swiss and the Germans were serious about chocolate, but Mulhouse's chocolatiers take it to a new level. 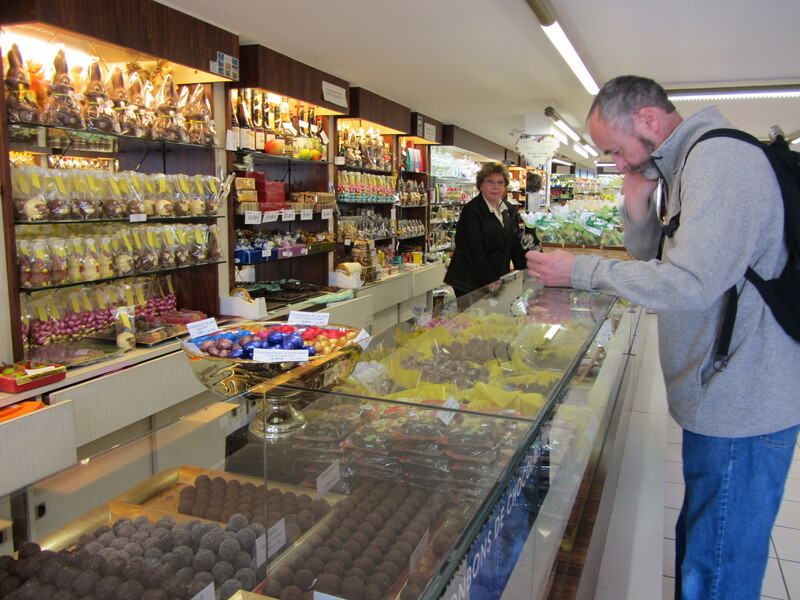 Do not miss the opportunity to try the local creme-filled chocolates. Ooo la la! 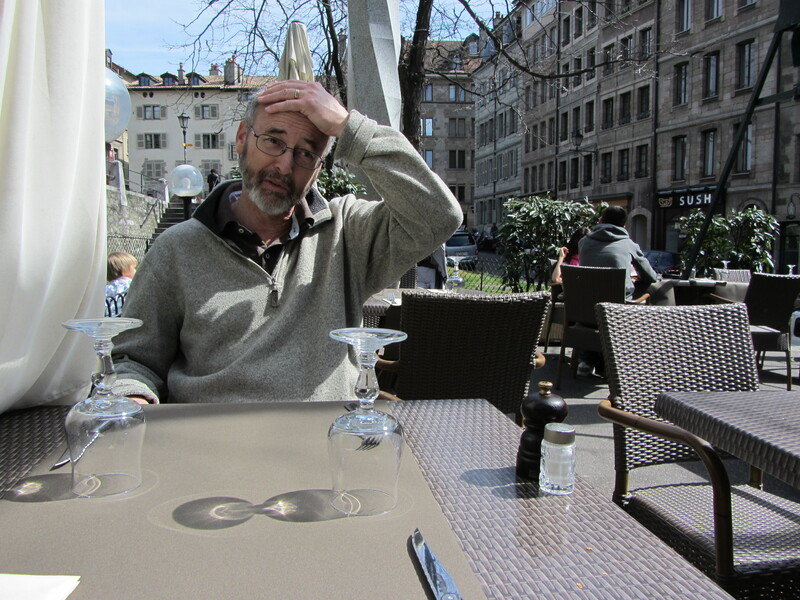 But back to Mulhouse: Is it worth the visit? Yes, it is, especially if you love museums, most of which I avoided due to my aforementioned intense allergy to boredom. This is the fault of my early education which was packed with field trips to museums where we mostly stood around in large packs waiting for a guide to finish explaining to us the importance of weaving in ancient populations. It was fine for a person so inclined toward textile history, but that is not for everyone, especially not for a bunch of eight-year-olds. 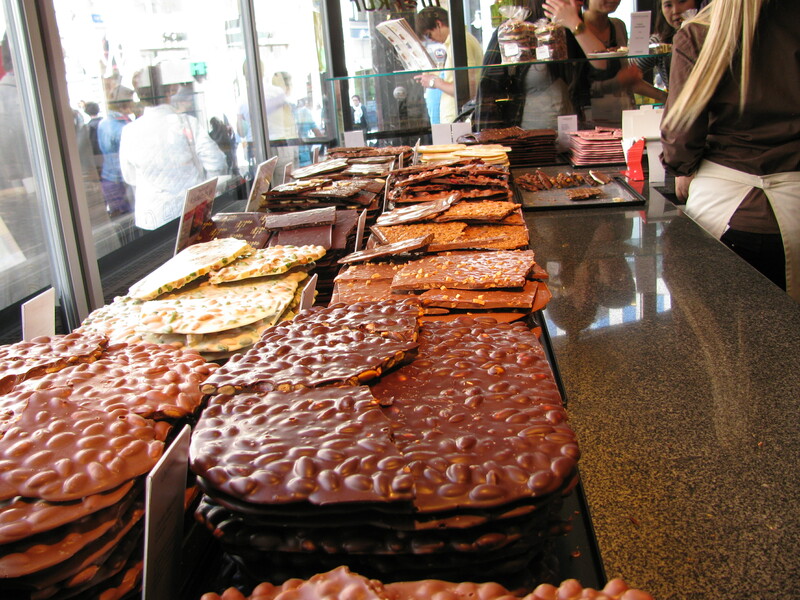 And while you are there be sure to taste the goodies from its numerous chocolate and pastry shops. They might be more responsible for the existence of the French national character than any past armed conflicts. The ice cream is not as good as Italy’s, but it is still delicious and proof that if the French understand anything, it is how to treat cream, sugar and all the good that flows from these ingredients. 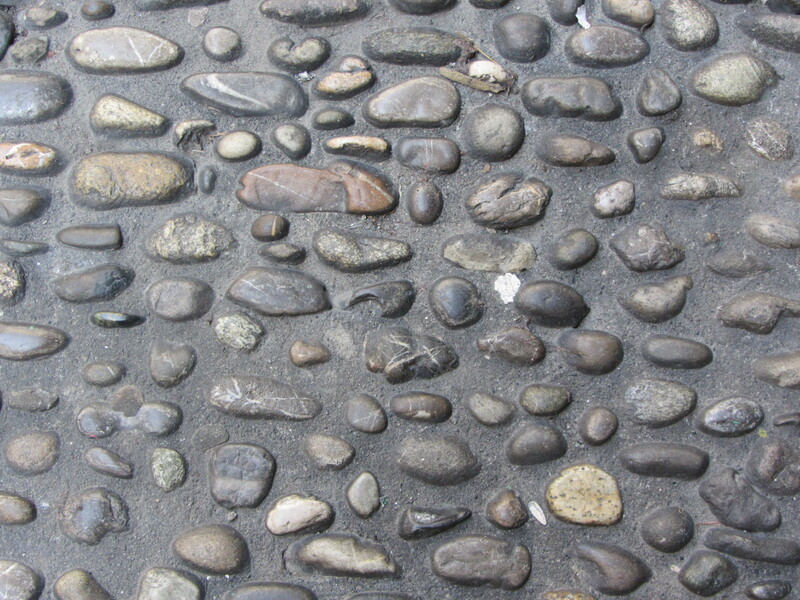 (Roll mouse over photo to bring up slideshow buttons). 98: French fils et filles – c’est bon or non? A French child playing quietly at an outdoor cafe' in France. 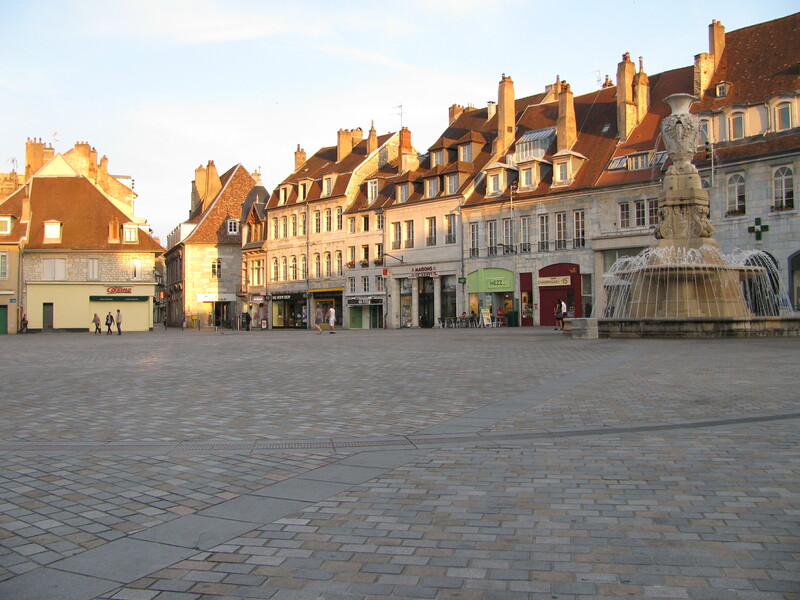 Yesterday’s one-day research project into the conduct of French children and the efficacy of French parenting was carried out over the cobblestoned medieval square at Mulhouse, a museum-laden town in France’s eastern Alsace region. Pity me, working so hard. 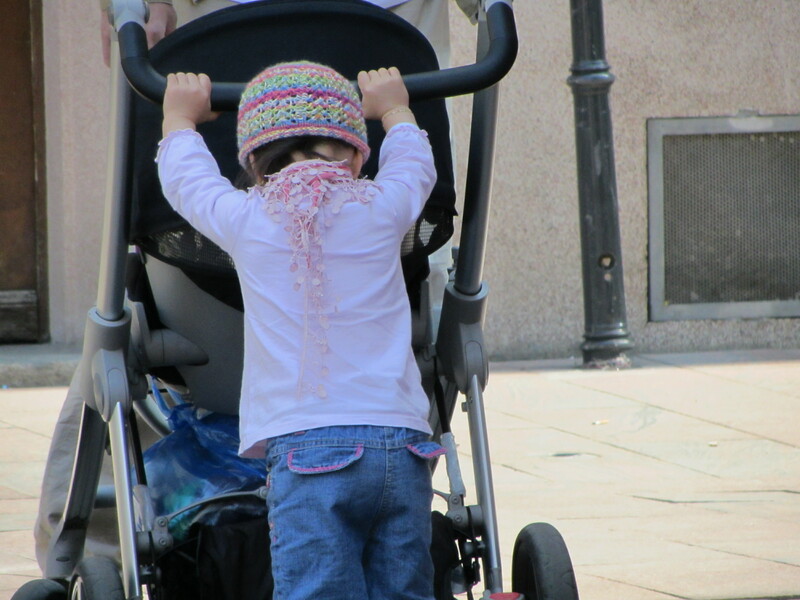 The task was triggered by American author Pamela Druckerman’s assertion in her hit book Bringing Up Bebe that the French know more about parenting than do Americans. You can have a grown-up life, even if you have kids. You can teach your child the act of learning to wait. Kids can spend time playing by themselves, and that’s a good thing. This dog raised two boys, neither of whom turned to a life of crime. It’s worth noting that these four tenets are nothing new. Focus on the Family founder Dr. James Dobson wrote the same stuff back in the 1970s. Before then, my mother took #3 to an extreme level by pushing us out the door immediately after breakfast and not letting us back inside until supper. 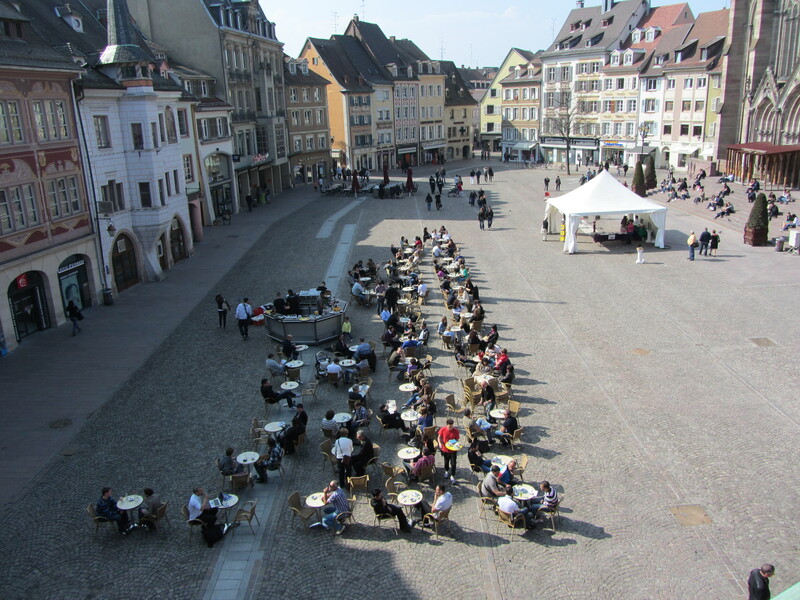 Outdoor cafes in town squares are lovely car-free zones to teach children about restaurant manners. They can sit quietly with the adults, or safely blow off steam by running around the square. 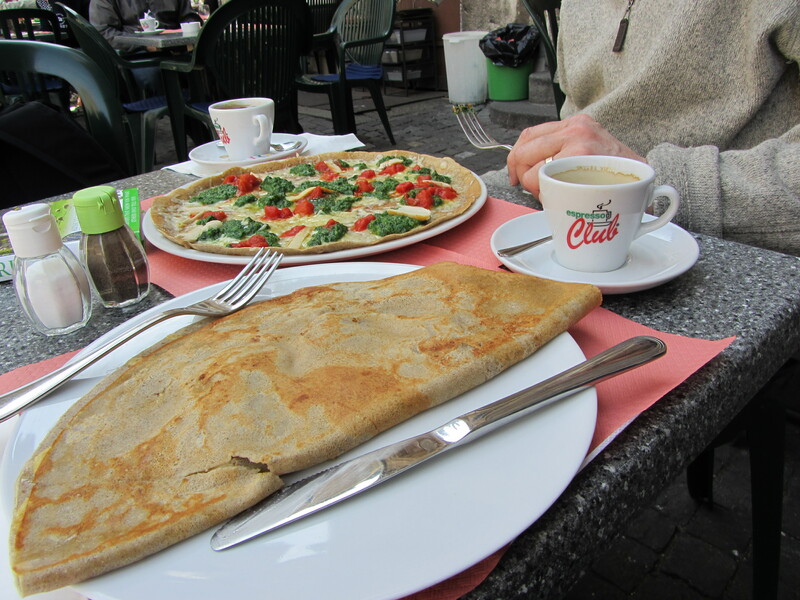 In our afternoon of observing the French, we saw many children dining quietly at street cafes, trundling contentedly along the pedestrian malls and frolicking in the cobblestoned squares. Recalling the wailing kids we had seen in North American Wal-Mart stores, it seemed that Druckerman might have a point. Then Dave saw a fussing four-year-old girl whose mother delivered to her a solid whack on the bottom and a stern reprimand. A little later, another siren-whine of some random child cut through the crowds. Two whiners in one afternoon seemed on-par with North American over-bored and stuck-in-stores-too-long child stats as reported by the unscientific commission of me and my friends. 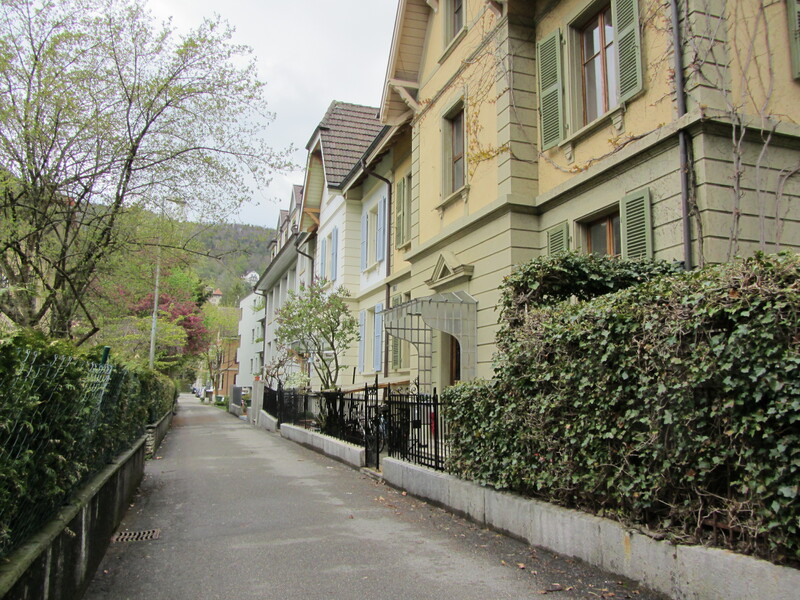 Here in Switzerland, the scene is very much the same, although overall the Swiss are a more restrained people than North Americans and it shows in their youngsters. There is another constant at work in this. The popularity of Bringing Up Bebe shows that not only the French are concerned about how to raise children, but that as a society, North Americans are, too. Otherwise, Druckerman’s book would never have made it to the New York Times bestseller list. Tagged A Cup of Jo, Americans, bestseller list, Bringing up Bebe, cafe, child rearing, Dare to Discipline, discipline, Dr. James Dobson, France, French, Joanne Goddard, labrador retrievers, Mulhouse, Pamela Druckerman, plaza, retaurants, summertime, The New York Times, town square, U.S.
Train-traveler packs one, two, three bottles/cans in full view for the trip. Drunks were everywhere this weekend. 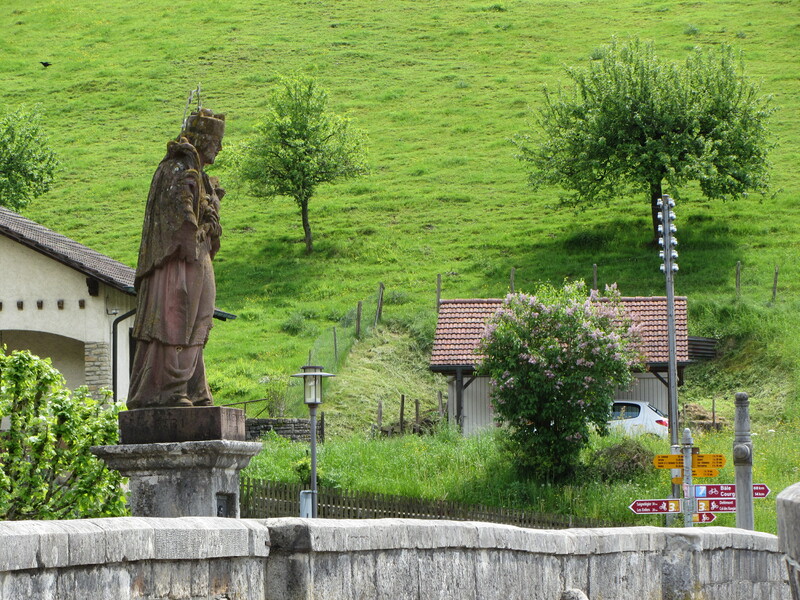 At the Bern train station, a dread-locked man bark loudly in the face of passengers stepping onto a train. 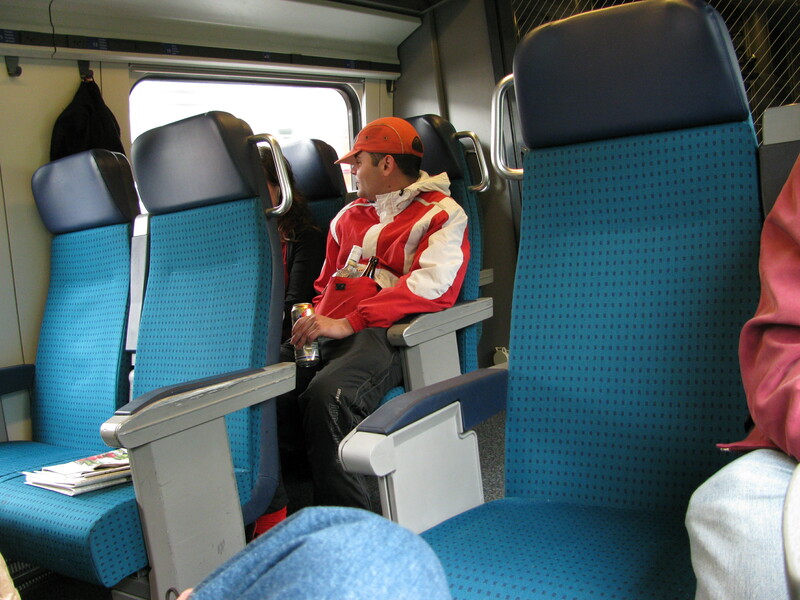 The passengers stoically looked the other way while he pressed in, determined to make his presence known, if not felt. Drunks upset the delicate social balance where we all agree that when we venture out, we not bark at others, and if we cannot stop ourselves from barking, then at least we should stay far enough away so that our victims are not soaked in our saliva spray. Is it too much to ask? Apparently so. This guy must be going on an overnight trip. Staggerers, shouters, boorish keg-carriers – I judge you all. Given the unpredictability of drunks, especially that their moods switch swiftly from party to sour to let-me-punch-someone-in-the-face, we quietly moved to another car. 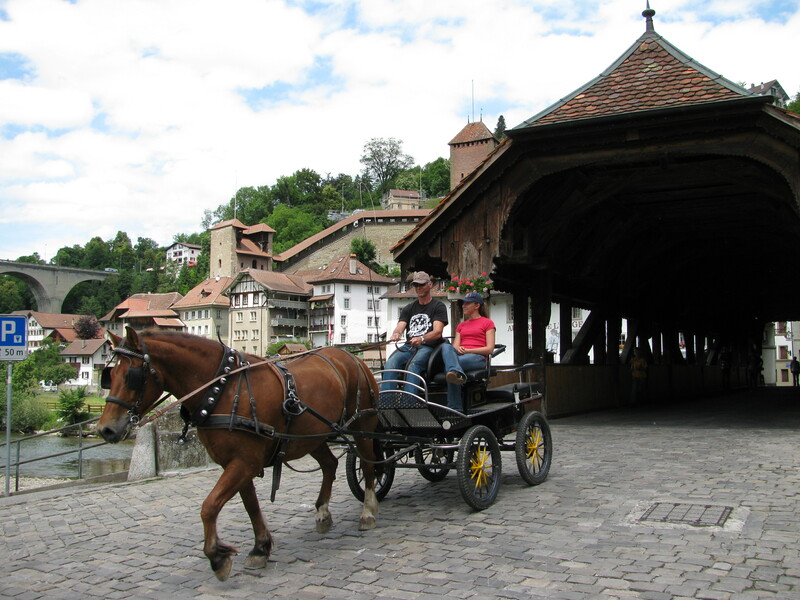 At Fribourg's covered bridge. 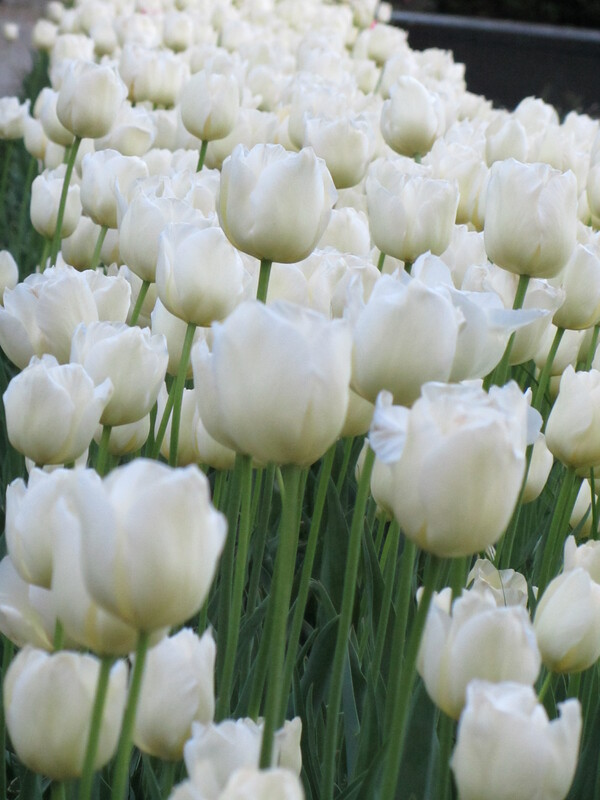 Isn't it charming? 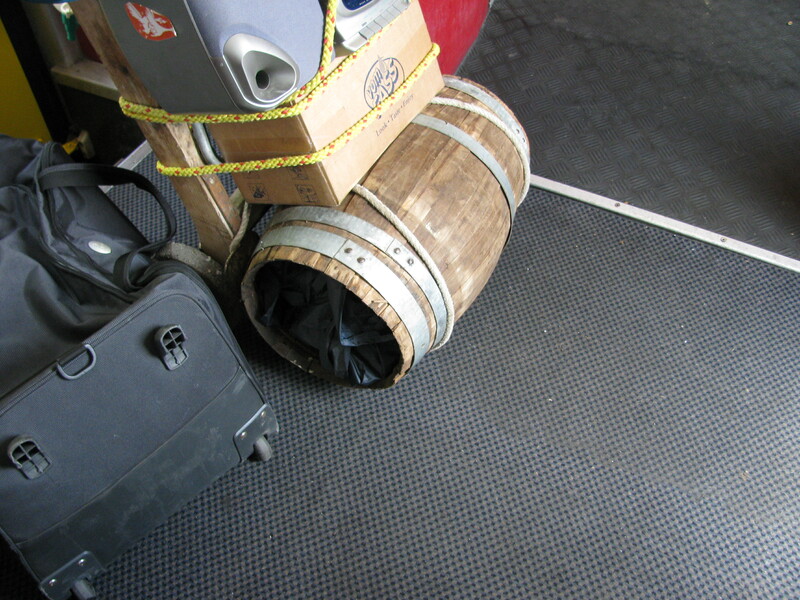 We could barely notice it, thanks to booze-soaked wanderer. Last week, on the train to France, a tattooed scramble-haired man in an agitated state sat across the aisle from us, hissing into his cell phone. Was it a drug deal gone bad? Was he going to take it out on us? 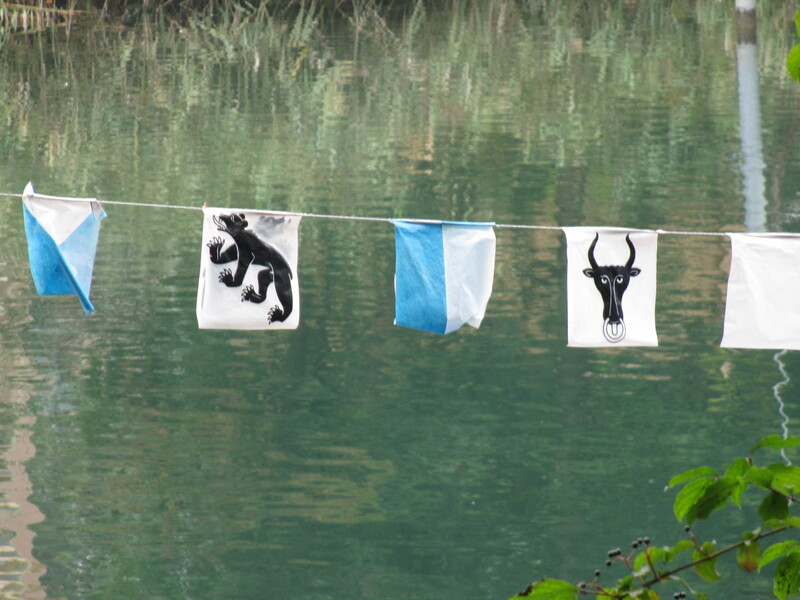 It did focus our minds, but not on the French countryside. 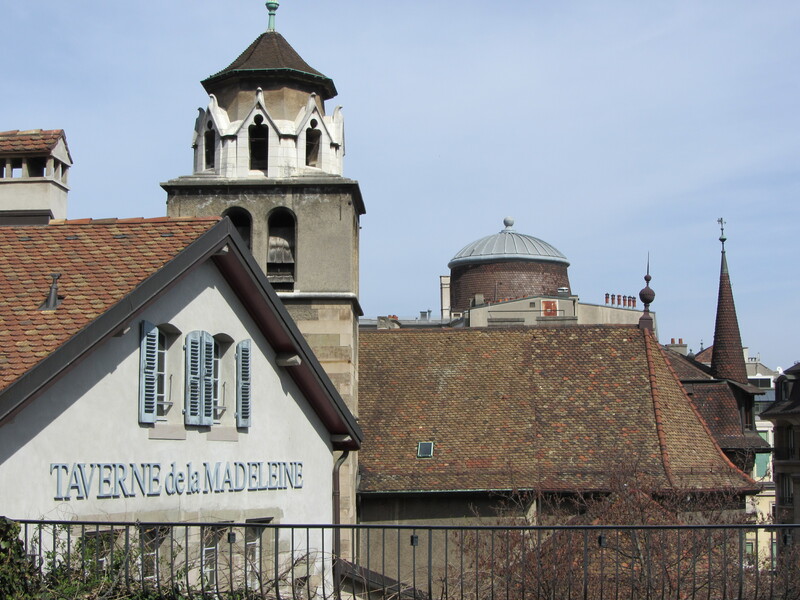 This weekend, as we got off the train at Fribourg, we were happy to leave the drunken yowler behind, but after we made the walk down Fribourg’s plunging cobblestone streets and through its rustic wood-beamed covered bridge, we heard a familiar sound. The skinny yowler staggered into view. How was it that he was still standing? 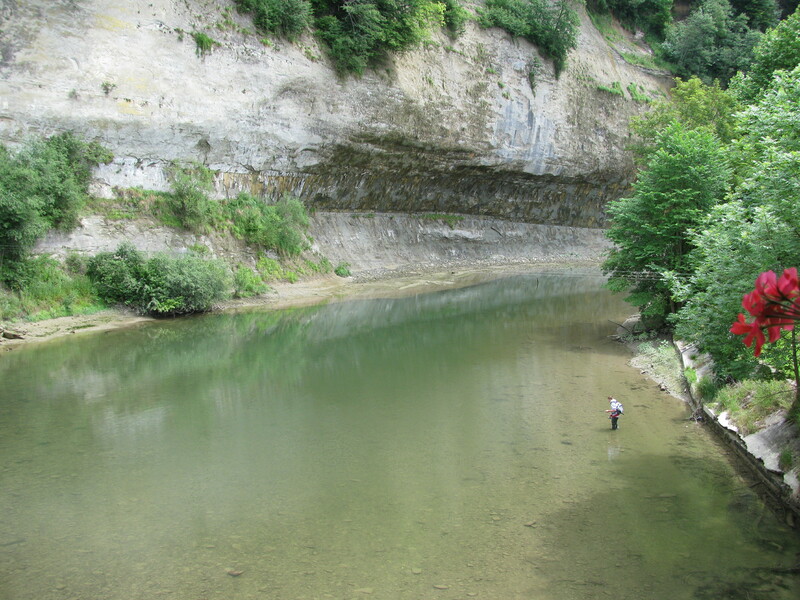 Eroded limestone hangs over the river at Fribourg. See the fisherman in the lower right corner. He is having a good day, because he has not met our drunk. We had just taken out our map to plot our course, but the yowler, not the map, was going to decide where we would go. He turned away up a narrow side road, his arms flailing, his head cocked oddly, while he continued in that strange thin bellow. We took the road that he did not, and it was an enchanting road, but it lost some of its allure as we kept an ear open for the yowler. For the first time since arriving here, I missed my car. 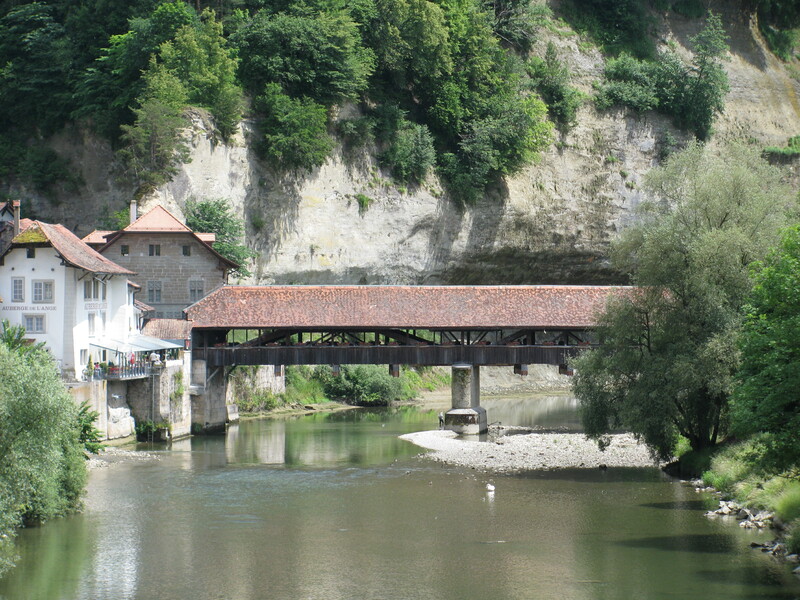 Fribourg's 40-metre long covered bridge, called the "Bern Bridge," dates back to the 17th century and is made of stone, wood and dirt. Yes, dirt, which is also the reference that I make to drunks. 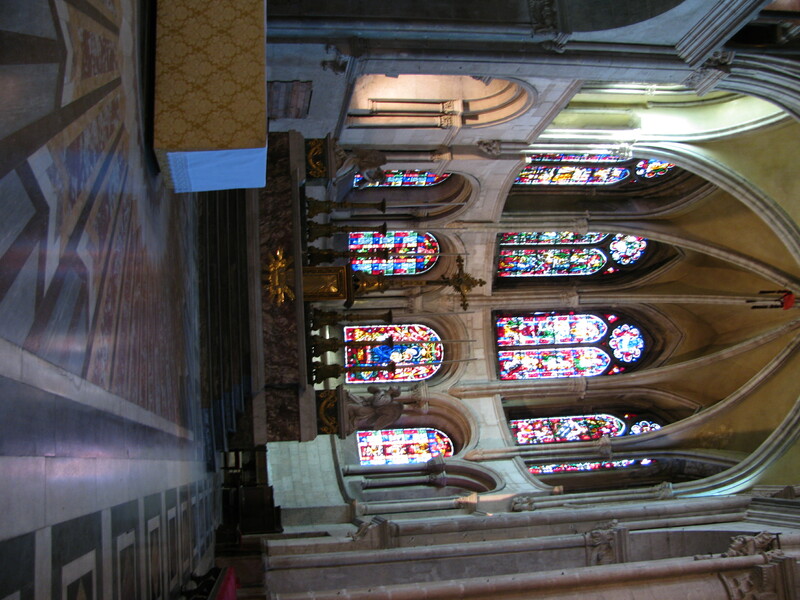 12th Century portion of Besançon's Cathedral Saint Jean. At least, that's what the guide inside the church said. 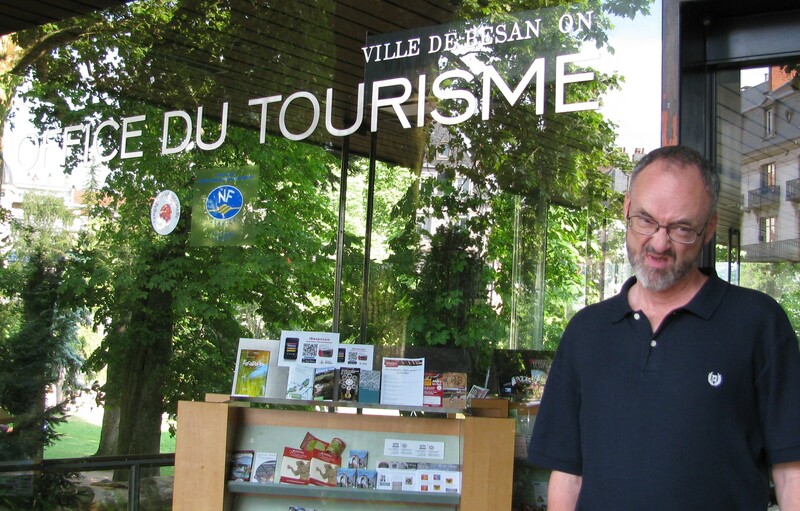 As is our custom on most of our travels, we made our first stop at Besançon’s tourist office so Dave could pose by it with a frustrated expression at finding yet another French tourist office closed on a weekend. They say retired couples should find a hobby they can do together and this is ours. 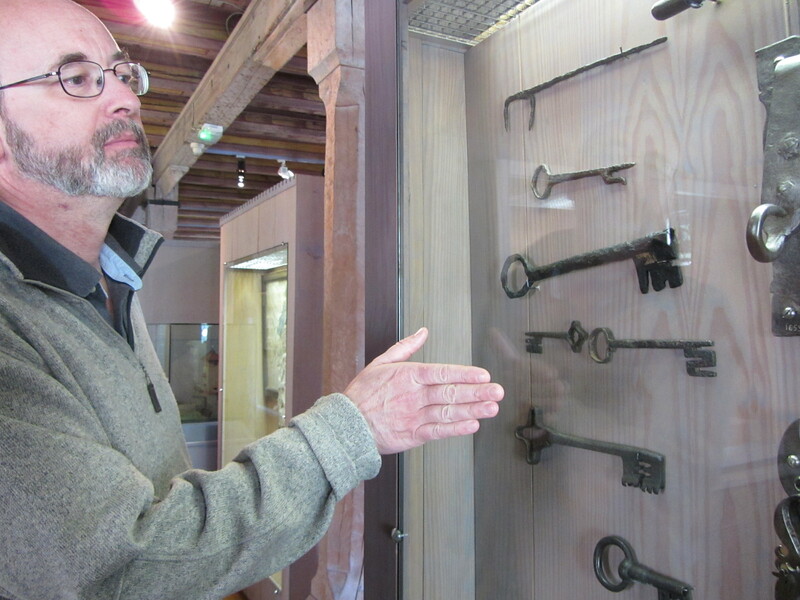 Dave expresses his opinion of France's tourism bureau, which laughingly seems to be closed just when visitors are most likely to show up. To be fair - this office was open the following day. Then we made our way across the bridge to Besançon’s Ancienne Ville, an old-town that dates back to the 16th century, and even older is Besançon’s outstanding St. Jean Cathedral, parts of which herald from the 12th century. Despite the fact that Besançon’s national identity eddied about in the streams of conquest (last post), it appears that its conquerors did more to build it up than to tear it down, and so for a small city, it has the pricy ambience of a large one. Some writers have described it as a miniature version of Paris, and rightly so. Like Paris, it has broad pedestrian avenues flanked by stone buildings ornamented with elegant woven wrought iron balconies. 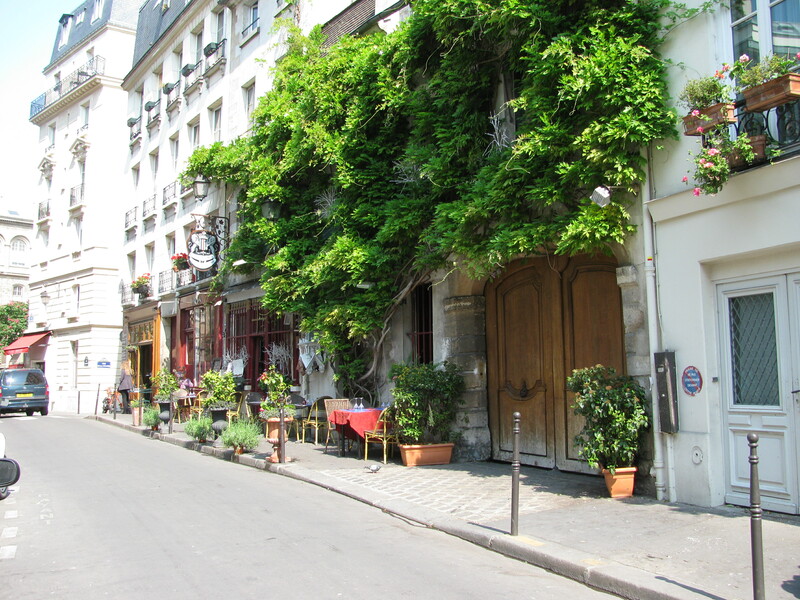 Unlike Paris, its old town is impoverished when it comes to trees. Besançon's Revolutionary Square, which is a lot bigger than it looks in this photo. vendors. 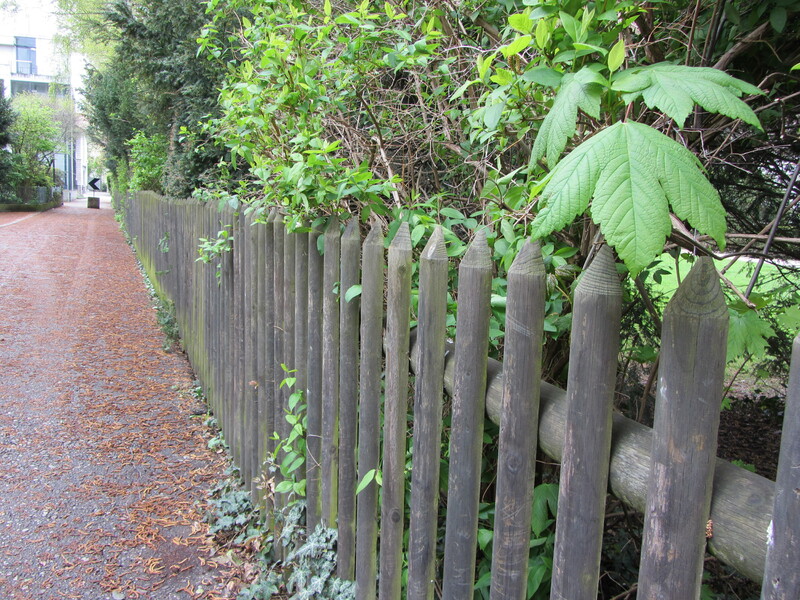 This is not to say the city didn’t have greenery – it had plenty, just not in the old quarter. 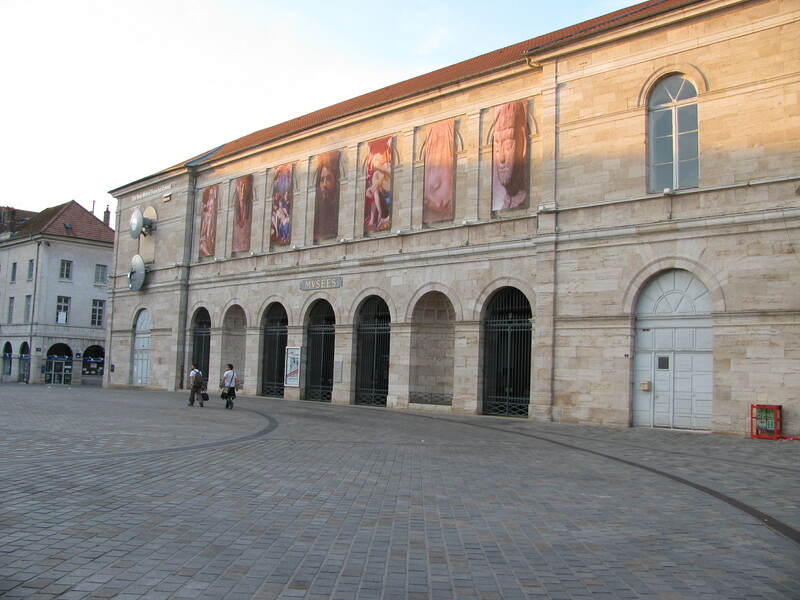 Unlike Paris, Besançon does not strip visitors down to the last penny. 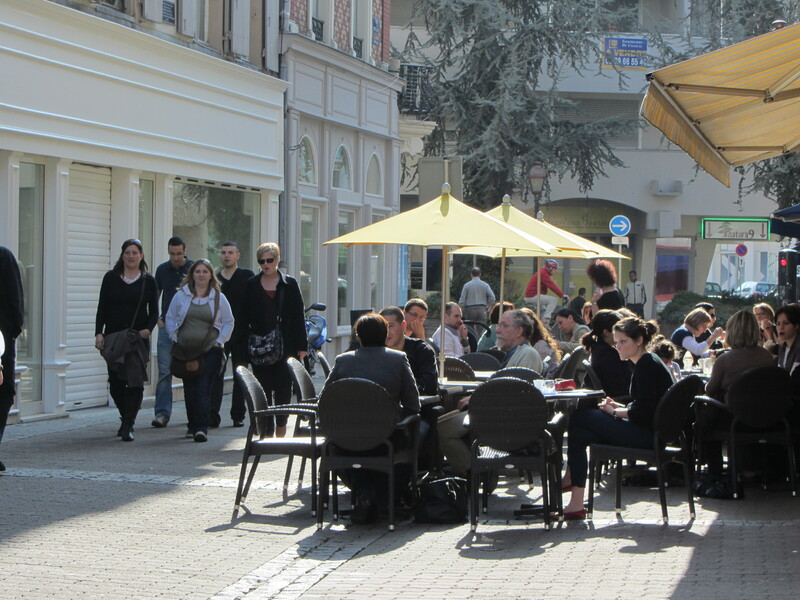 Visitors can sip on an espresso at a sidewalk cafe in the town’s broad Revolutionary Square for only 1.50 Euros. We almost fell off our chairs when we saw the bill. And for those on a budget, a cheap lunch can be had at Besançon’s “Subway” sandwich restaurant – and before you turn up your nose at eating at an international food chain, the French do things with bread even in a franchise operation that seem impossible in North America. 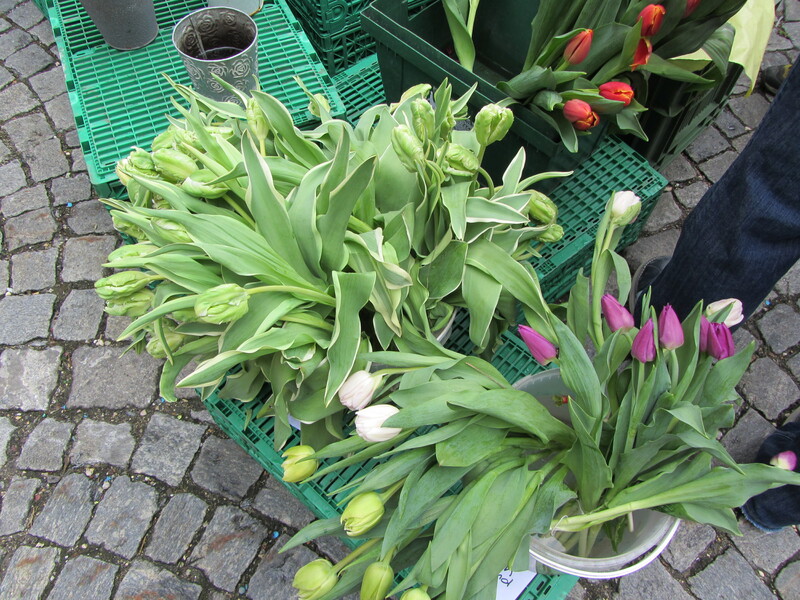 We handed over 12 Euros for a fresh lunch for two, thus allowing us to splurge on our supper bill. Whether the supper was worth it, I will tell tomorrow. 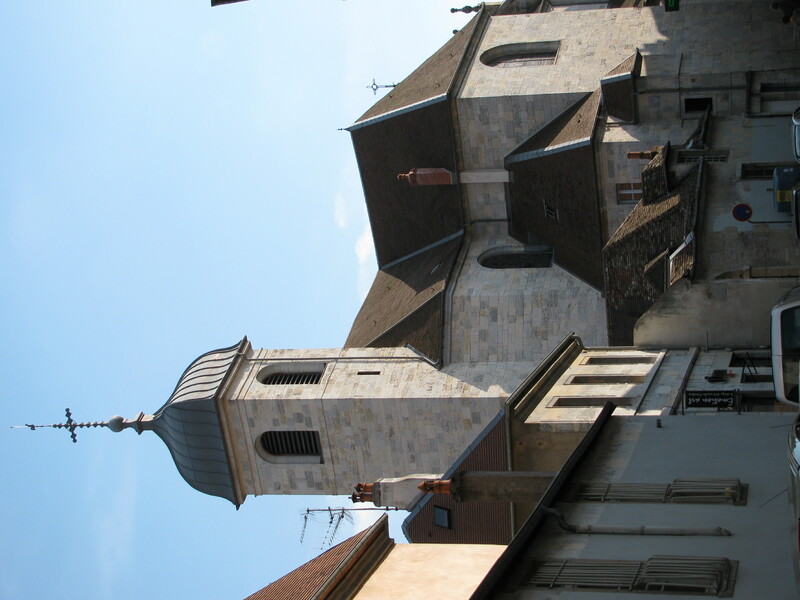 A church in Besançon. Wouldn't it be nice if I knew its name? 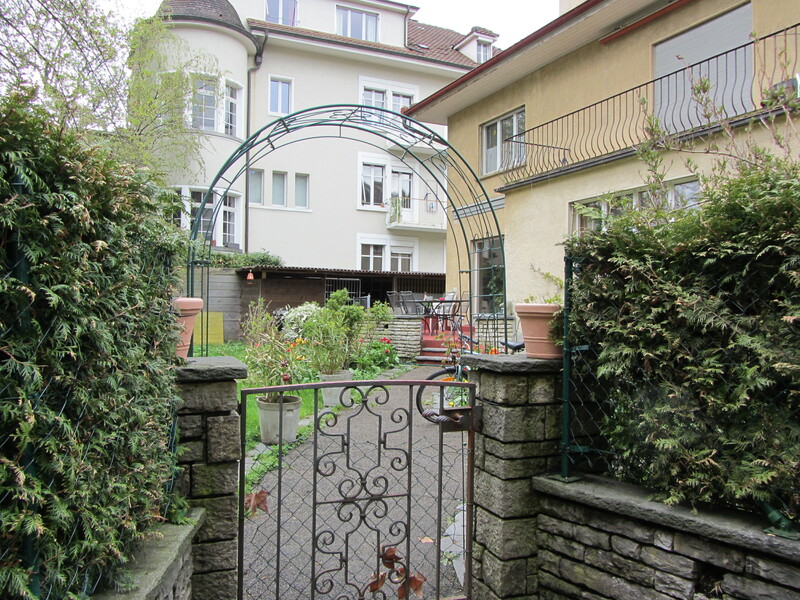 Knocking on Victor Hugo's door - or at least, the door to the apartment building where he was born on February 6, 1802. See how I hang my head? It is from years of knocking on doors as a reporter, steeling myself for abuse. Let's face it, I deserved it. Besancon: French, German, Austrian, Spanish, Roman, Hungarian, then French town. You don't expect to see an elaborate Egyptian display at a small French city with a population of about 120,000, but the French are known for their elegance, so why not? In other words, by the time we got down to booking train tickets and hotels, there was not a seat or a bed available. 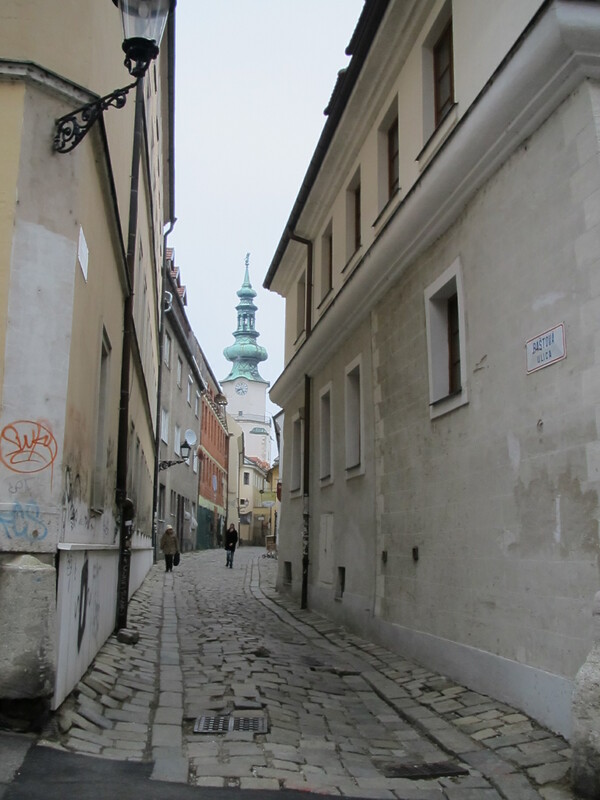 We could not have gotten onto a train to Vienna unless we were prepared to ride Tom-Cruise-style, that is, on the top, while engaged in hand-to-hand combat with a John Voight look-alike. We should have remembered this from our time in Madrid, when we discovered that six-hour, two-hundred mile traffic jams on the highways leading out of the city over long weekends was a normal event. 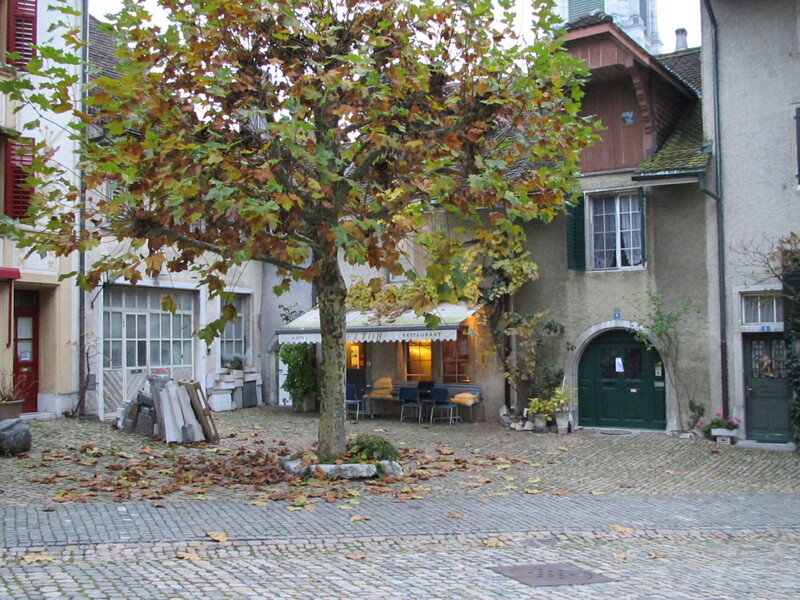 And so we satisfied ourself with shorter jaunts – the earlier trip to Neuchatel being the first. That turned out exceedingly well, and so we braved the French border once again (you may remember our last venture into France started with getting electronically kicked out of three hotels, before landing in an expensive Waldorf). We headed to Besançon, an ancient town settled by Gauls in the Bronze Age (1500 BC) in the oxbow of the river Doubs, and, because its location presents such a strong military advantage, Julius Caesar’s boys naturally showed up and said, “We’ll take that.” Which they did. We think of modern Europe’s borders are being permanently marked with indelible ink, but the Europeans did not treat it that way. Besançon was part of the Holy Roman Empire, then was accorded independence, which is a way of saying no military power would defend it, and so it subsequently came under the Habsburgs (through marriage, not war, although some would say the two are the same). Museum of Fine Arts and Archeology with origins dating back to 1694, although this building, a former grain hall, only dates back to the 1800s. In the 1960s its interior was completely refurbished by Louis Miguel, a man who is forever doomed to only be addressed as "a student of Le Corbusier." He deserves better. The interior is spectacular. Did I mention this town has only 120,000 inhabitants? And yet they somehow pulled this off. We mock the French, but we have to hand it to them. They have culture. That means the Austrians – or was it the Hungarians – were in charge, and then, in some kind of closet-cleaning decluttering exercise, they handed it over to Philip II, King of Spain. Spain is nowhere near Besançon, and as soon as the Spanish realized the inconvenience of managing such a far-flung district, they tried to hand it back to the Austrians via marriage, but the Austrians were not to be fooled for long and less than a hundred years later, the Spanish discovered Besançon had somehow crawled its way back into their closets. That was in 1667, but whether it was French, Spanish, German, Prussian, Hungarian, Austrian or just plain Catholic was not decided yet, because French monarch Louis XIV fancied Besançon and claimed it, but then lost interest and within months ‘forgot’ it on Spain’s doorstep. 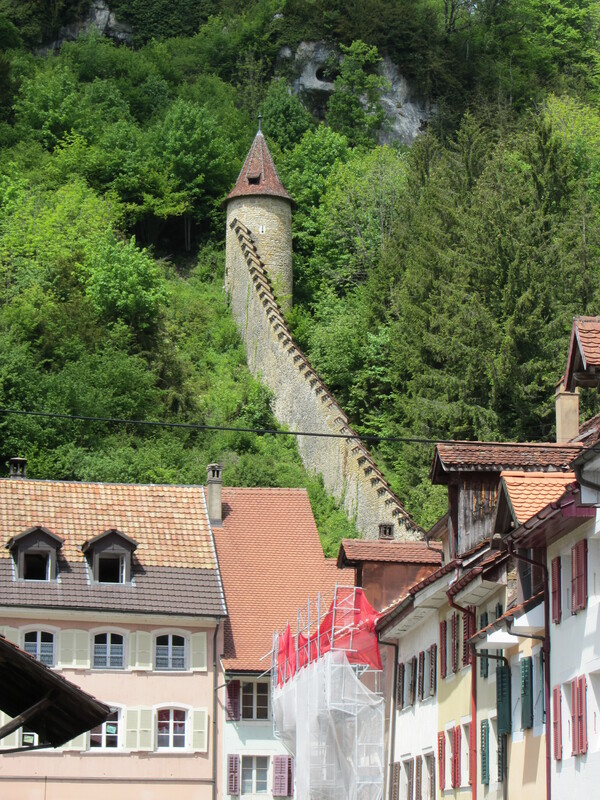 It boomeranged back to the French, then in 1814 the Austrians had a change of heart and bombarded the city. Finally, the Germans, probably sick of all the back-and-forth, grabbed it, but finally it ended up back in French hands after the Nazis were routed out, but not before executing 100 French resistance fighters there. 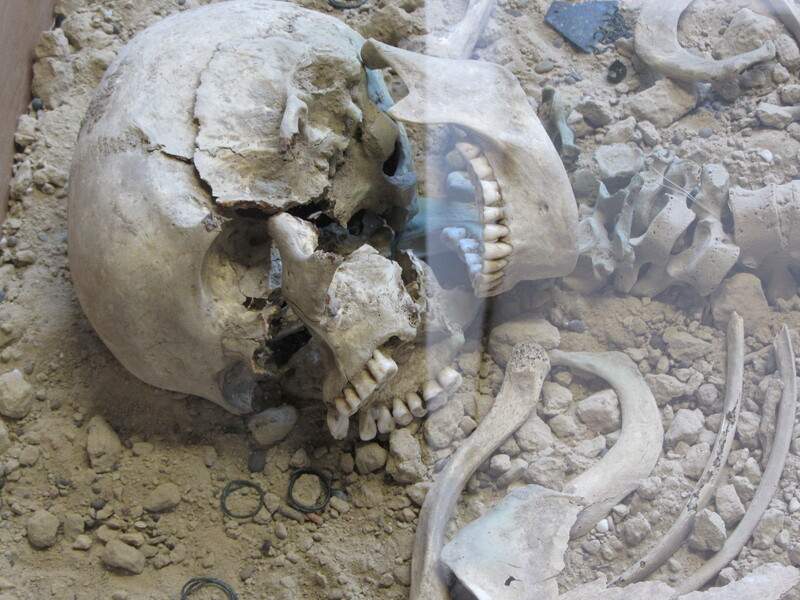 What all this leads to is that Besançon has a fascinating museum with great archaeological finds, including an intact Roman soldier’s helmet and a second-century BC Neptune mosaic. 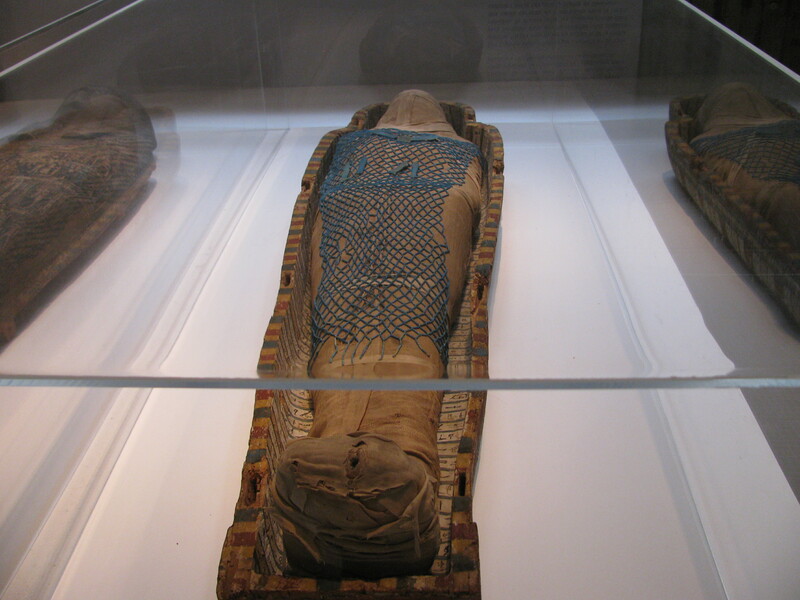 The museum is 100 years older than the Louvre, and is a good place to see the works of Matisse, Goya, Picasso, as well as an Egyptian mummy display. Egyptian stone works are right out in the open, and I couldn’t resist drawing my hands along the pharaoh profiles, touching the same granite and sandstone as the long-ago artisans, which I really should not have done, at least that’s what the museum security detail told me, but the rebuke was brief, as though the French are resigned to their collection of sculptures and hieroglyphics getting pawed by Americans. Which I am not. I am Canadian, but why tell the French that when they are so happy to think otherwise? 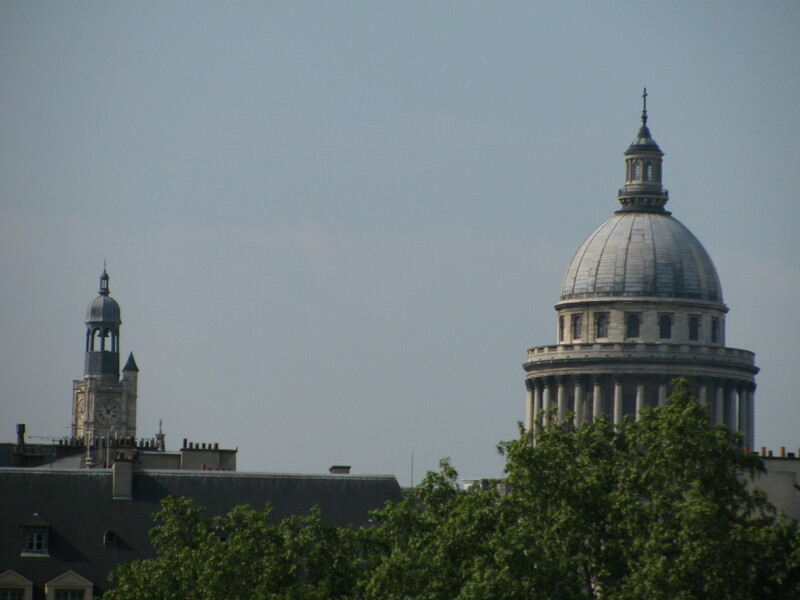 A Paris riot – or just random running? 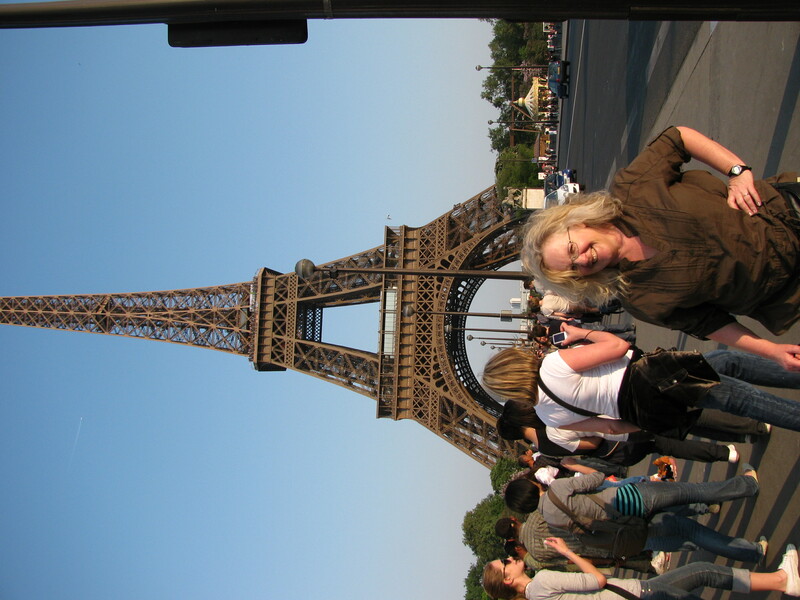 As we crossed the Pont d’lena bridge on the northwest side of the Eiffel Tower, we heard a loud jingling noise. Was it Christmas? The noise grew. Young men with Middle-Eastern complexions were racing around us in what looked like the start of a riot. Oh good. Something to write home about. It was actually Dave the Alert who noticed that only dark-skinned men were running, their rings of souvenirs filling the air with their musical jingling. It was a very contrary scene. On the one hand, we felt the pressure of herd-behavior and wanted to run. On the other, the jingling made me reach for my wallet and look around for a Salvation Army kettle. I did not notice the runners’ ethnicity right away, but I was cognizant of the fact that France’s controversial new prohibitions on face-concealing burqas had just come into effect. Joanne, perspiring from recurrent hot flashes, not from near-almost-mob-trampling. Seriously, hot flashes are more scary. Yes, I’m writing it just like that. It’s politically incorrect to notice anyone’s race/ethnic-origin these days, but as a retired reporter, I just say it like it is, and it is like this: Recent ethnic-group-targeted-law + Middle-Eastern males in flight = Get the Heck Out of There. I could take the oblique route and say no blond middle-aged women were seen fleeing the scene, but that’s only because I (blond middle-aged woman) have 1. a bad Achilles tendon, and 2. am too dense to realize when something is happening, even if something is Middle-Eastern males running at high speeds through a city famous for Muslim-youth riots only a few years ago. 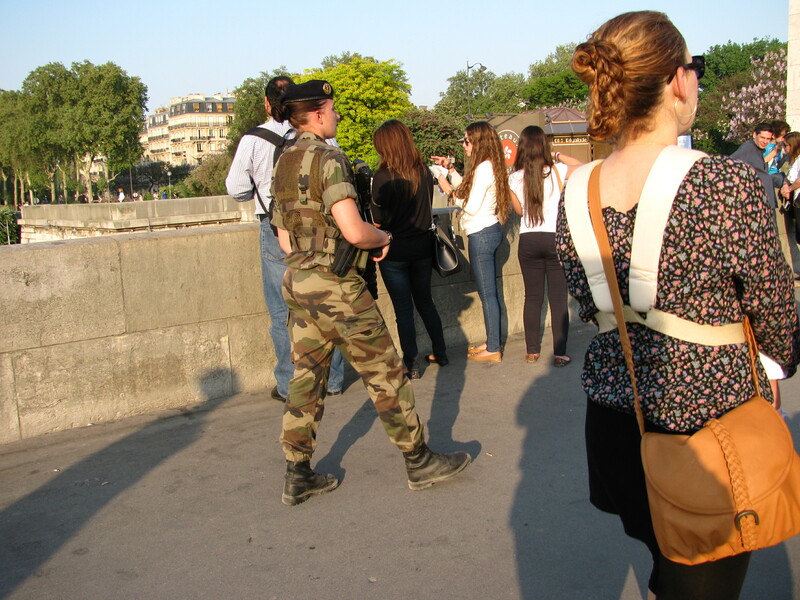 Soldiers, arms at the ready, patrol Paris's streets. Within seconds, we found ourselves standing alone on a broad swath of pavement that moments earlier had been packed with people. This could not be good, and then we saw the reason for the running. His strut drew attention even from across the street – a Paris police officer. We quickly ascertained that those fleeing from him were unlicensed vendors, and maybe even illegal aliens. Who knows? The police made no attempt to chase down the vendors, who actually raced through a line of armed soldiers, who also made no move to apprehend. 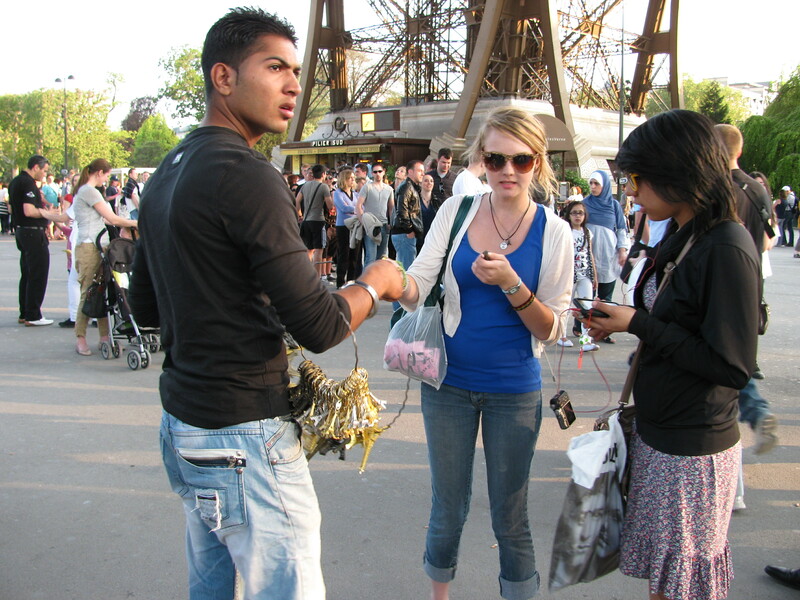 It was clear this was just business as usual, although for the remainder of the time we were at the Eiffel Tower, the vendors kept a watchful and anxious eye out on the crowds. Sadly, the police officer and soldiers refused my request to take their photo. I did not argue. This will surprise police officers in Victoria who know me, but it may have been because of the assault rifles and Glocks in full view, and the fact that I was a guest in a foreign country, and so on my best behavior. Tomorrow: Thieves in Paris – cute, adorable, efficient. 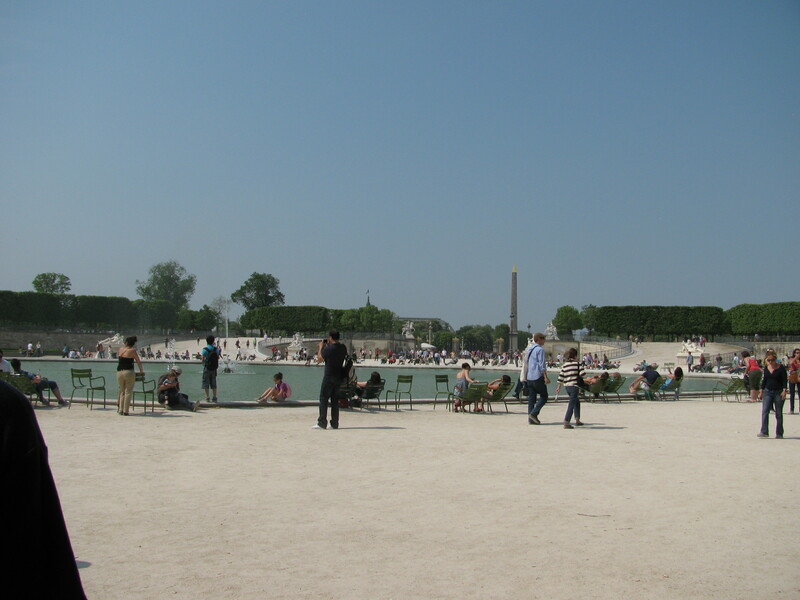 A giant circular pond of green brackish water in Tuileries Garden attracts sunbathers. As I sit here in our Swiss flat with the patio door open, an Italian domestic spat is going on downstairs. It’s what we call a “breaking story,” so I’ll report on it in italics (how suitable) as I enter today’s scribblings on our trip to Paris. It is a testament to spin doctors of all generations that the word “garden” is imbedded in the name Tuileries Garden, which are the grounds outside the Louvre. I use the word “grounds” deliberately, because it suggests a flat, uninterrupted horizontal space, which is what we found, instead of the expected cultured urban forest. The woman’s voice climbs upward into an elegant aria, accented by a few words here and there from the man. I have no idea what they’re saying, but it sounds like an argument over him spending too much time on the phone with his mother. 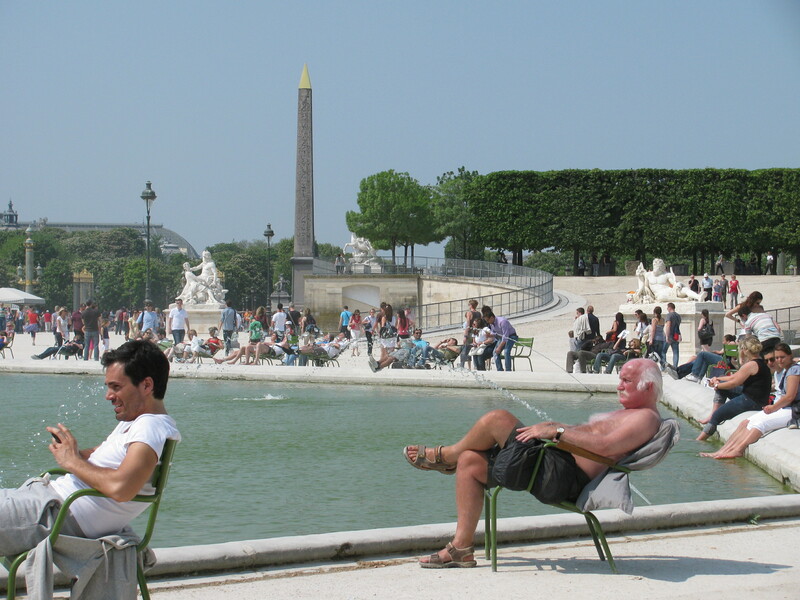 A 19th-century sculpture, or a modern-day visitor in Paris's midday sun? 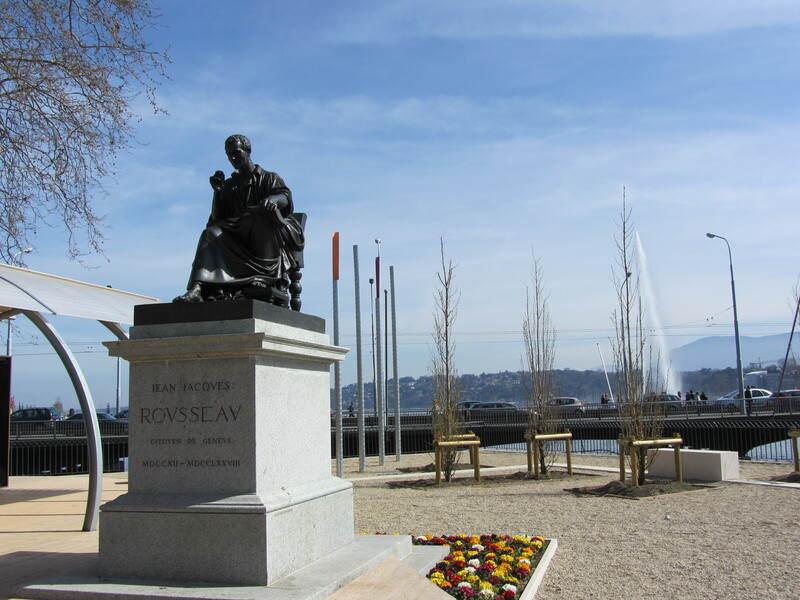 Who would have thought the French would lay a belly of gravel as a garden centerpiece? The garden (term loosely applied) is almost 500 years old, so we looked forward to strolling beneath broad sweeps of mature shade trees. It was not to be. 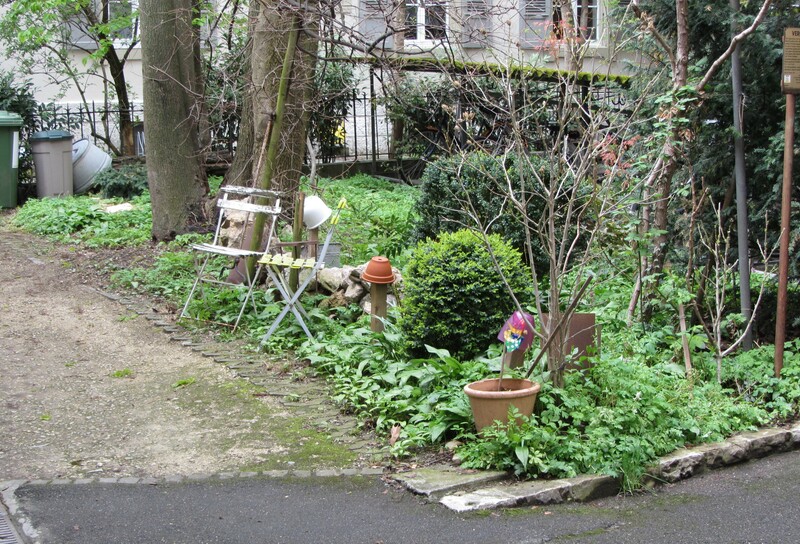 Paris must have a very hostile climate, because in its few scattered groves, the trees that it did have were about the size of the cherry trees we planted in our backyard in 2004. The woman lectures at machine-gun speed, the man responds in short resigned sentences. A later generation of Tuileries’ garden planners circa 19th-century, probably seeing the trees were not doing so well, trimmed the gravel flats with stone sculptures of human figures in various stages of angst, foreshadowing the postures of modern-day visitors withering under the sun. 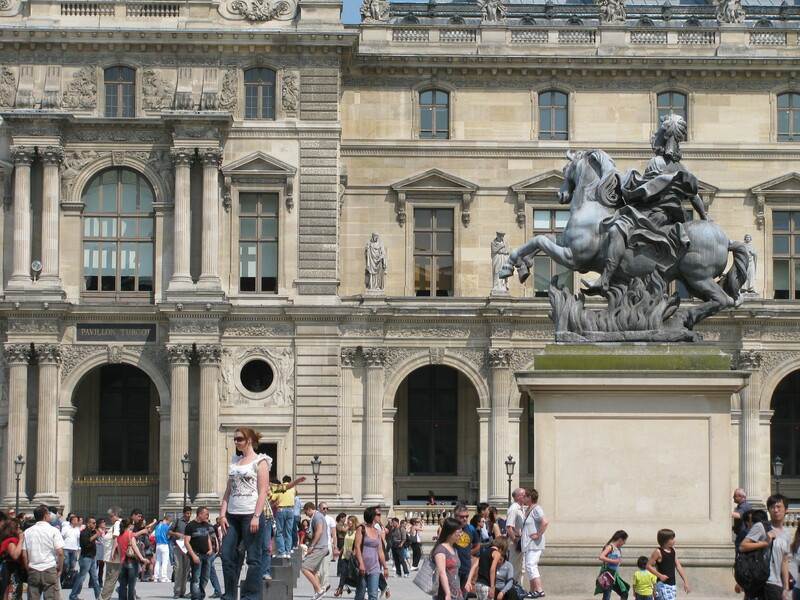 The Louvre, the mobs and some guy on a horse trying to get through it all. A door slams! The woman has left! 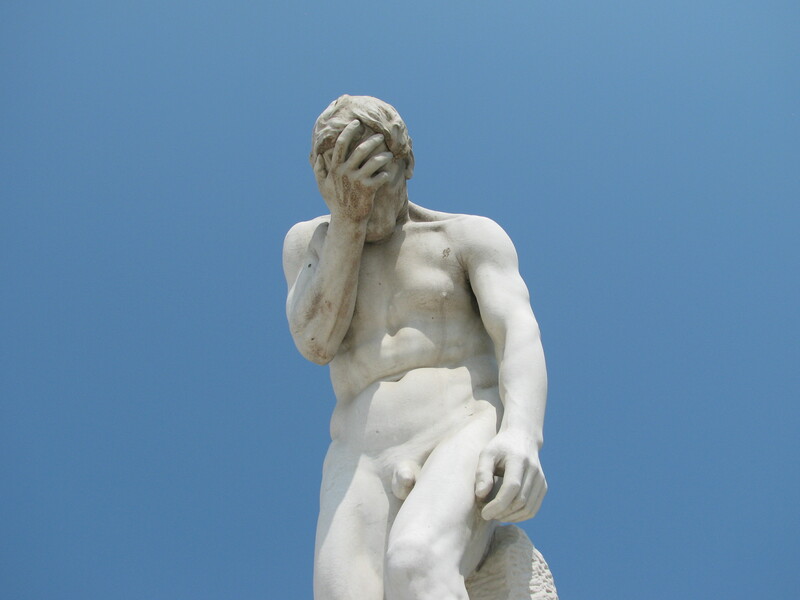 How did the sculptors know? We were fascinated by their foresight. Either that, or the heat stroke brought on by standing in the furnace of a stone-and-gravel chamber has rattled our senses. We now understand the French Revolution in a new light, which had some of its most poignant events occur in the summer heat. Of course the French were cranky. What else could they be? As for the Italian revolution downstairs, the woman is back. I knew she would be. She tells the man she loves him. He tells her the same. She says something else. He grunts. Her voice goes up – yes, they’re back at it again. The "garden" outside the Louvre. Someone comes into the room – the mother-in-law perhaps? She has a more mature voice. The couple’s tone softens. The woman takes a few cloaked stabs at the man, then, the sound of cutlery, and the older woman’s voice. Ah, she is solving their argument with food, the force that has sustained Italian culture over the centuries. Tomorrow: More Paris – the homeless, the fake riot and train-station thievery. Charming little cafe near the Notre Dame Cathedrale. According to its signage, the cafe has been in operation since 1594, ie. shortly before my ancestors decided they had enough of this place and bolted for Canada. This in no way should be taken to reflect my family's opinions on French food. 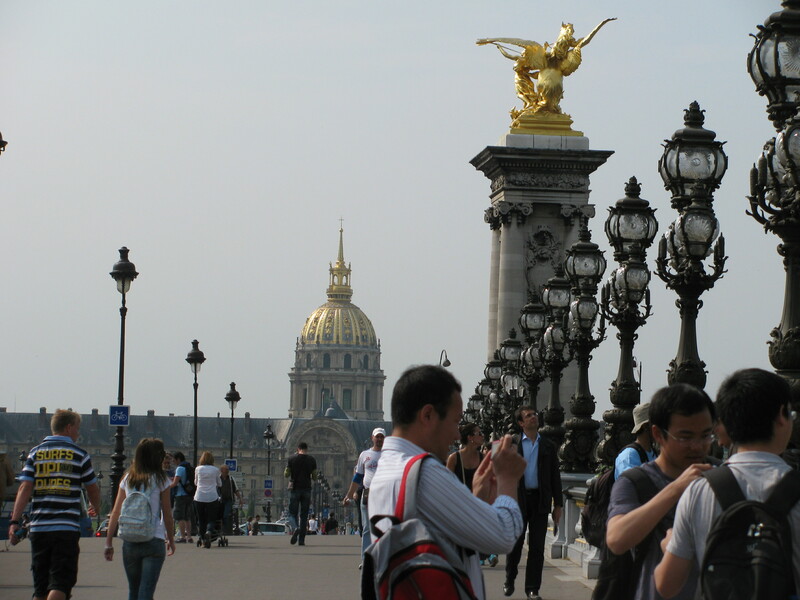 Pont Alexandre III: Beautifully embellished bridge, and like so many Paris sites, built for the 1900 World Fair. 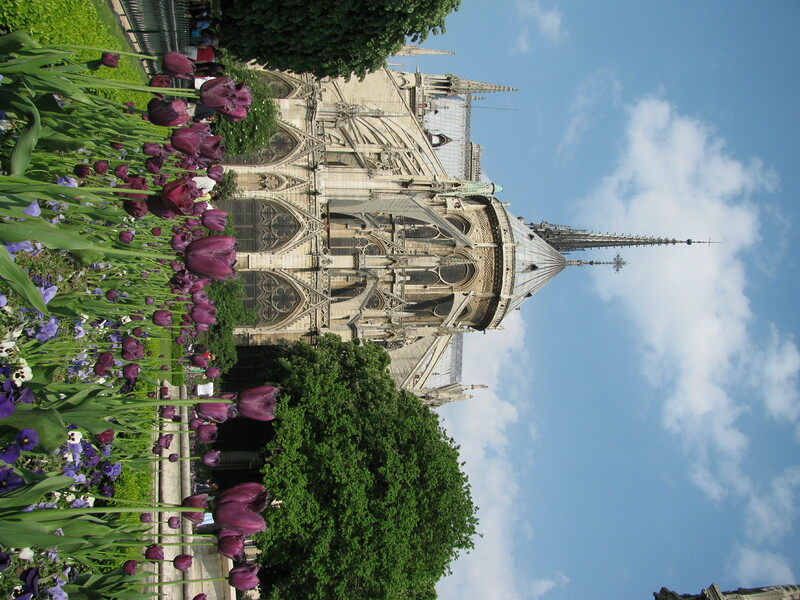 Cannot imagine what a dull place Paris was, architecturally speaking, before the World Fair. 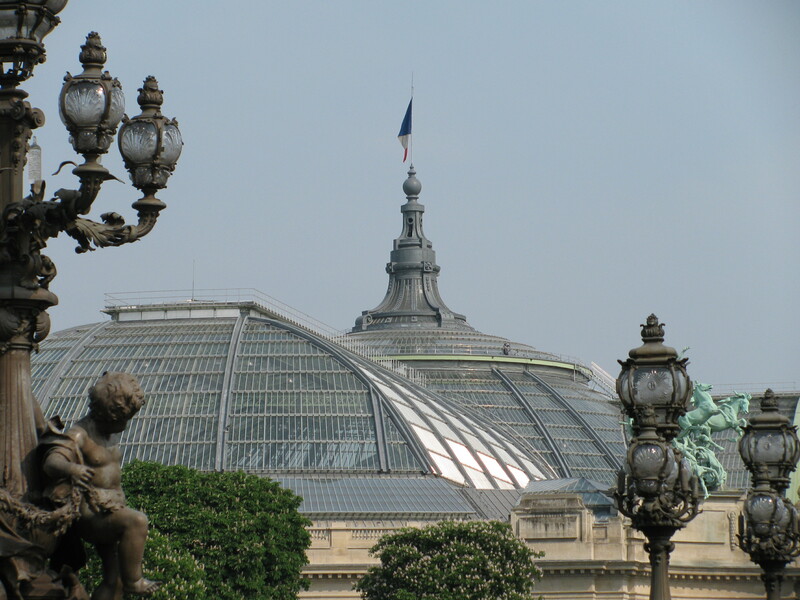 Grand Palais des Beaux Arts: Art nouveau iron and glass structure erected for the 1900 World Fair. 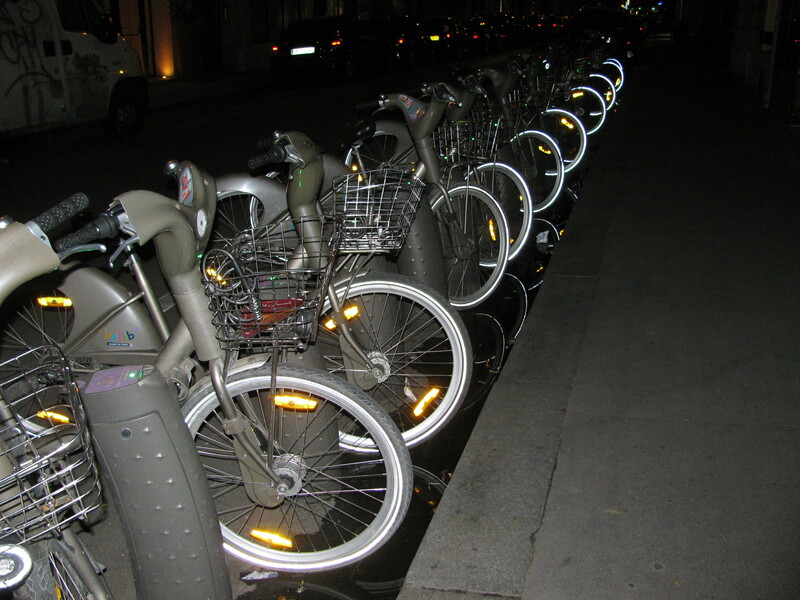 A rental bike post outside of our hotel (Waldorf Arc d'Triomphe on rue Pierre Demours). These stands were all over Paris. We didn't rent any bikes, owing to our terror of French roadways and the drivers that populate them, but saw quite a few being ridden by tourist-types. Cathedrale Notre Dame de Paris: Christian site since 250 AD, church building started of one sort or another existed on or near here since the 4th century. 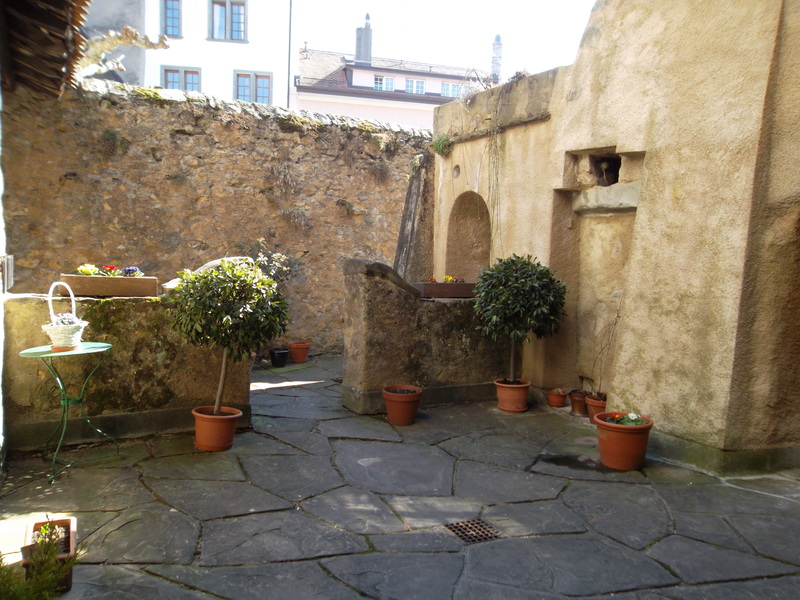 This building's construction began in 1163. 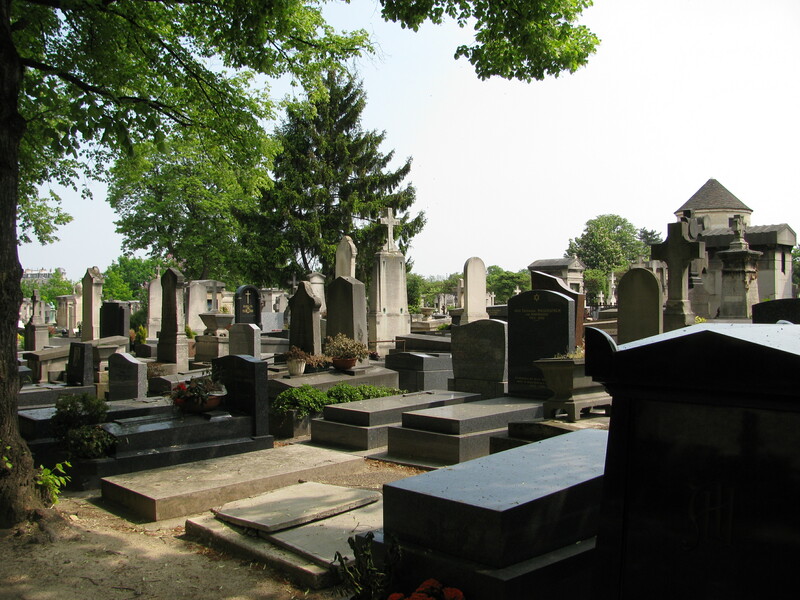 The cemetery at Montparnasse, burial-place of many notables including Emile Durkheim (pioneering sociologist), Simone de Beauvoir (French philosopher, author), and the Roy family, of which we may or may not be related through my maternal great-grandmother.